The main door to the Civilian Office of Police Accountability’s offices in West Town. CHICAGO — Goodbye, IPRA. Hello, COPA. The Friday launch of the Civilian Office of Police Accountability comes a year after being created by aldermen reeling from furor that enveloped the city after the release of a dashcam video showing a police officer fatally shoot 17-year-old Laquan McDonald 16 times. It will start the clock ticking on the latest effort to hold Chicago police accountable for misconduct and close the book on the beleaguered Independent Police Review Authority. But even as COPA chief administrator Sharon Fairley celebrates the creation of the new agency — “from scratch,” she said Thursday in an interview in the agency’s West Town offices — the hard work of convincing skeptical Chicagoans that officers who abuse the public trust will be punished will begin. 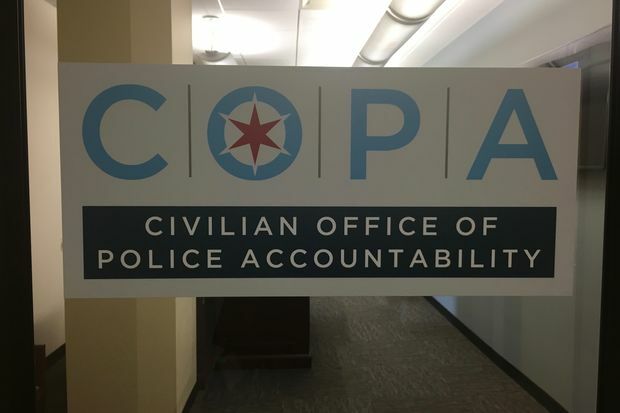 COPA will have nearly twice the budget and nearly 40 more investigators than IPRA, which was criticized by the U.S. Justice Department for doing a poor job of investigating police misconduct and holding accountable officers who had been found to have committed wrongdoing. Fairley said she looked forward to working with Attorney General Lisa Madigan to craft a court-ordered agreement to reform the Police Department based on the Justice Department’s findings. “That is a positive step forward,” Fairley said. Fairley, who has committed only to launching the agency, declined Thursday to say how long she planned to lead it. But Fairley said long-term planning for the agency was underway and said she plans to ask the City Council next month for a “fairly significant” increase in funding for the agency to hire more employees and build up the agency’s structure. The agency’s 80 investigators now on staff — the “best and the brightest,” Fairley said — will be more closely supervised under COPA rules and regulations, which were adopted only after members of the public had a chance to review them and suggest changes. A nine-member board made up of residents also advised COPA officials, Fairley said. Another 20 investigators are expected to be hired this fall, Fairley said. Those investigators will reflect the city they will serve, said Fairley, who was told in no uncertain terms last year by aldermen to ensure her staff was as diverse as Chicago itself. Half of all investigators are white, while 35 percent are African-American and 13 percent are Latino, COPA spokeswoman Mia Sissac said. White Chicagoans make up about 32.6 percent of the city’s population, followed by Hispanics at 29.7 percent and blacks making up 29.3 percent of the city, according to U.S. Census figures released Thursday. Ensuring COPA has a diverse staff is the best way to achieve “justice, fairness and neutrality,” Fairley said. The new agency will be more transparent and will allow the public to see how it reaches conclusions whenever possible, Fairley said. “That was part of the problem with IPRA,” Fairley said. In addition to the vacant investigator jobs, COPA will launch without a first deputy administrator and head of investigations. Efforts to fill those position are underway, Fairley said. COPA also will launch without a civilian oversight board in place to keep tabs on its operations. Fairley said she “begged” Mayor Rahm Emanuel not to delay COPA’s launch because the board’s structure is still under development. “IPRA was dying on the vine,” Fairley said. Although several aldermen said last year the civilian oversight board was critical to earning the trust of angry Chicagoans, Fairley said she thought it would be “prudent” to wait and see how COPA functions before establishing the oversight board. COPA will be overseen not only by the Chicago Police Board but also Laura Kunard, the deputy inspector general for public safety in city Inspector General Joseph Ferguson’s office. A civilian board could be “excessive,” Fairley said. “They will be on top of each other, and we don’t want them to step on their toes,” Fairley said. In addition to wary Chicago residents, who have seen police reform efforts come and go with little lasting change left behind, COPA will face a dubious Police Department and police union. Martin Preib, the second vice president of the Fraternal Order of Police Lodge 7, told the Tribune this week that the union’s leadership did not believe officers would be treated fairly by the new agency. Preib declined to speak to DNAinfo Thursday about COPA. Fairley acknowledged that COPA faces a daunting task in convincing police officers that its investigators are not out to get them at time of declining morale. Fairley said COPA would participate in the effort to craft a new city contract with the police union, saying the current deal was flawed and had complicated efforts to hold officers accountable. Police union President Kevin Graham, elected in April, said he would fight “the anti-police movement in the city” during the contract negotiations.